Intel Optane claims it comes with "exclusive digital spaceship" the Saber Raven. The graphics panel will have 118 slides. There are tech demos on the floor showing how the planet editor works, showing the tools and how planets are made. 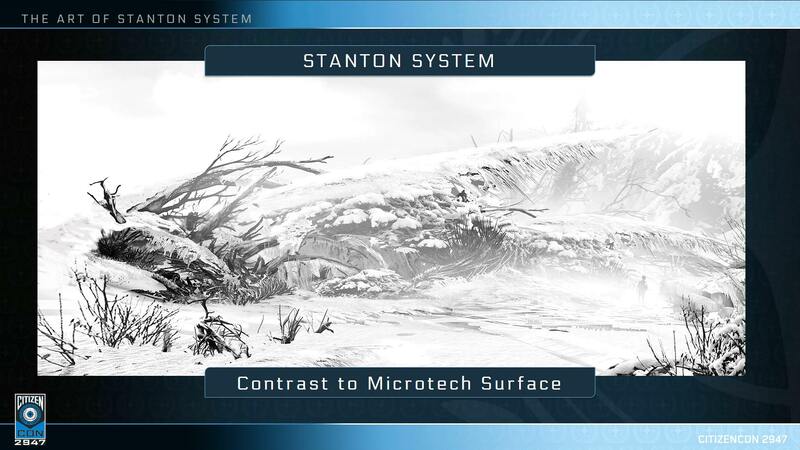 The Stanton panel later will go through visuals of the moons and how they develop the tech alongside while they create the moons. Panels will now all be in UK time, as everything’s been pushed back an hour. We’re seeing a video of a box. And a ship being shot. Caterpillar just got blown up by a Connie, looks beautiful. Box if falling down to a planet. The box is on stage. And now so is Chris! 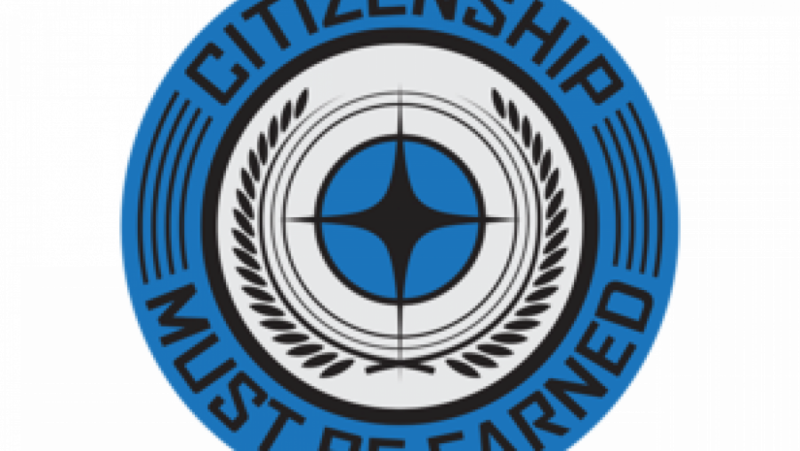 Intel have sponsored CitizenCon this year, allowing them to do things at a larger scale. CIG are in bed with Intel confirmed. David from Intel’s coming out to talk about the optane a bit. They’re launching the new hardware today at CitizenCon. SSC uses Intel Optane - very low latency, like an SSD, but very good performance. Intel gave CIG many of the SSD’s for them to develop on. Devs get faster compile times with the Optane cards, they’ve changed some of the IO setup to rely on the new tech. The Sabre Raven was designed by Nathan Dearsley, there’s a video of it now. Unclear currently whether the Raven is exclusive only to purchases of the SSD or not. Hopefully not. Fastest dedicated dogfighter. Twin EMP’s, laser cannons, etc. Punches above its weight. Exclusively with the Intel Optane 900p. Intel has given away 150 of the drives at CitCon. Brian Chambers is now on the stage. Look IK is used to have an NPC look at the player or a target. They’ve got different types of look IK. One where it’s off, one where it’s always on. When he’s constantly looking at the camera, it looks kinda strange. They broke up look IK into three parts - 0 IK being off, and 100 being on. They did it manually at first, but they’ve changed that and it’s now done more automated. One of the devs used his spare time to create a look IK toolkit to automate the process. The toolkit helps them blend the two IK types into a third more awesome IK type. Evo Herzog is going to talk about how to teach characters to walk on stairs. Stairs cause problems as they’re just a straight plane. Legs clip / float. Used to be characters couldn’t go over boxes; anything higher than 20 cm would be a motion blocker. One way to solve the problem would be to create more animations. 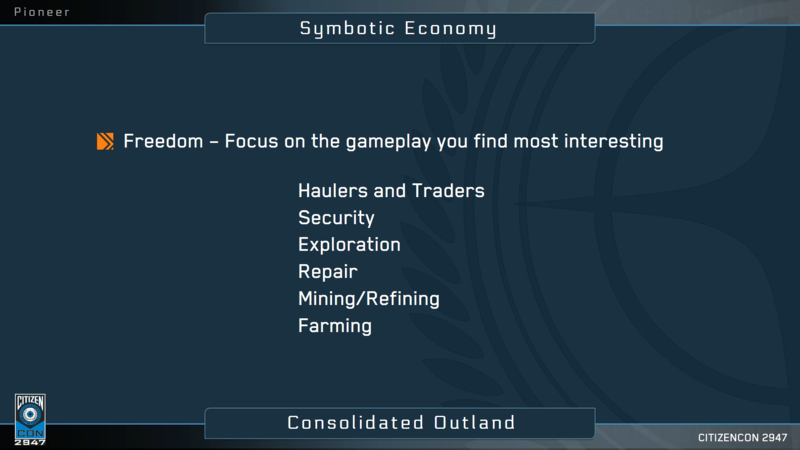 But there are too many situations and you can’t consider all of them, so they tried to find a procedural system. In the Lumberyard SDK there’s a system called ground alignment, which fixes the slope / stairs problems. The system takes a flat animation and transforms it on the fly. The feet react hugely well in this system. Looks excellent. Not the entire foot has to align with the ground either - character can stand with just his toes on the ground. Ivo wrote the first version of this in 2006, but it only works with slopes. THey need a different feature to work with debris and stairs. The new tech they’ve got for moving over small objects is insane. I have no other words for it. It looks absolutely amazing. Actual stairs. There are actual stairs. And the characters walk on them. Actually walk on them. This is insane. Amazing shots of footprints in soft materials with dust rising from them. What they’ve been showing is a small example of the animation challenges they’re taking on. Normally every section of a game has run through rigorous testing. In Star Citizen, it’s not as simple, because of the procedural planets. There are situations where it’s possible - and what they’ll be showing throughout the day today - is you could be on a mountain on a planet that no-one else has been on before. No QA guy has seen it, up in some corner of the world, and you’re in a gun fight for your life. The animation system has to hold up. People want mining, logistics, exploring, etc… Everything needs to stay believable. The characters and the systems need to hook together. Brian Chambers is back - there won’t be any QA after this panel. The next panel will be tech with a focus on graphics. Back in a few minutes. It is unfortunately not possible to transcribe all the detail going into how they process each frame. Watch the video. 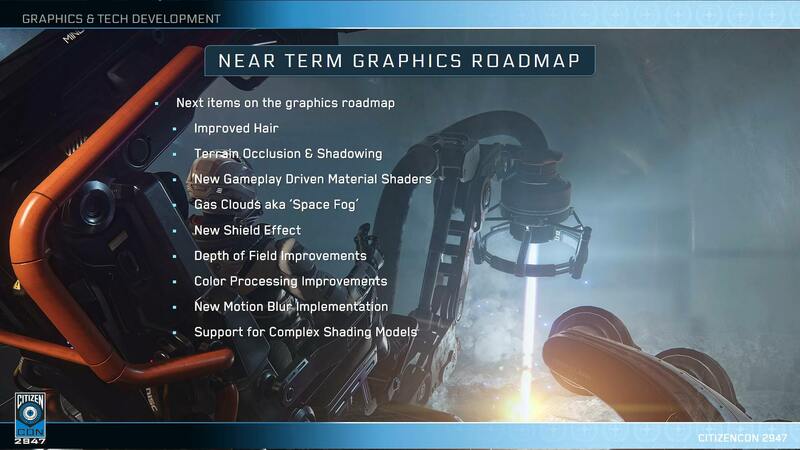 They go over dozens of different layers, explaining how each frame is processed to create the graphics of Star Citizen. Things in 3.0: Things already in 3.0 - P4K system, server performance improvements, planetary rotation, render to texture, temporal supersampling, improved screen space directional occlusion, filmic tone mapping curve, first of new material shaders. P4K system increases the time for in-office patchine. They can now patch in seconds. Server performance improvements - getting significant improvements to jittering and network bugs. Frankfurt team is taking the lead on pushing CPU parallelism / multithreading. Batch Updater - used to update batches of the same objects distributed over multiple CPU cores. allows for easy parallelization of game code. 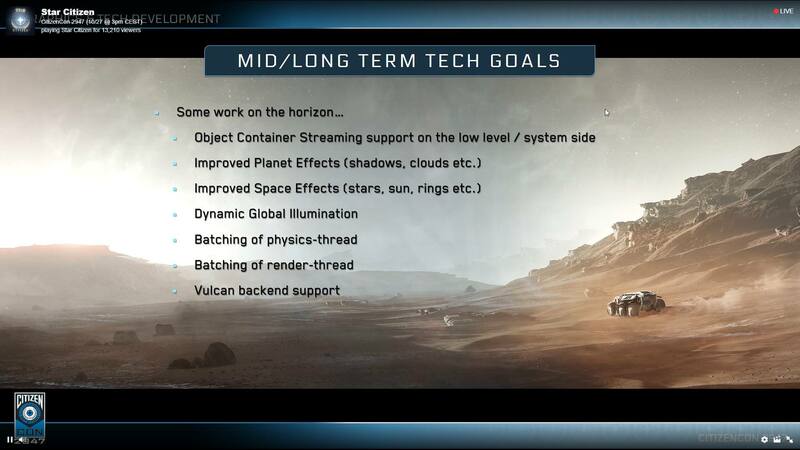 Mid/long term goals - object container streaming, improved planet effects, improved space effects, dynamic global illumination, batching of physics / render threads, vulkan backend support. Q: As far as tech goes, and what you’re involved in, what’s the most unique challenge for SC? A: Scale. Compared to everything I’ve worked on previously, there’s physical scale, solar systems and planets, dealing with all that and having effects work on rotating planets. Normally you have a small level where you can assume stuff. You can’t make assumptions when you have a complete sandbox open universe. Same with the gameplay scale - you can’t assume anything is fixed. Everything is dynamic and emergent. It stops us being able to assume anything so we have to be much more creative. Q: Possible thanks to render to texture to have internal bridge like in Star Trek, for the Polaris / secondary bridge? A: Technically yes, it’s possible, but framerate is an issue. If you want everything in there, you’ll halve your framerate. They won’t apply certain post effects, they won’t apply AA to holographs, there’s lots of scope for doing things. Depth camera, heat camera, those are easier. Doing the full rendering pipeline would be very intensive. Question of performance. And that’s it for the graphics presentation! A: Goes back to the same answer for the last question. Yes, they can. Depends on the cost / room though. Q: Most games use fake mirrors, is it possible to do real mirrors? A: Multicore is the key. It’s where everyone’s going. I7’s and i9’s have plenty of bandwidth, and we’re doing our best to fill those. Going wide is the way. In terms of a particular model, no particular model is best. Q: Lots of strain on the CPU - would you recommend more threads? 8 - 12 threads? A: We’d have to run it and test what the performance is. Generally the ice we’re giving to designers if it’s a constraint on the scenario we can do it. If we’re in a room and there’re no windows, I can get a view of somewhere else fine, cause that room only takes up a small amount of the frame. But if you’re in an open environment and you want to look at another environment, that we can’t do. Q: Render to Texture question - doing some sort of VR cockpit would be too much of a strain; what’s the extent of it? On the explorer armour there’s a camera looking thing on the shoulder; sending an away team and having their point of view displayed in a cockpit? Reasonable? A: They do papers, but we don’t take it directly from them. We do lots internally, the optics stuff was all in house. We take it from whoever does it best. Other stuff like area light implementation we took research from that that’s been done by other games studios. There’s no one source, it’s quite open in game development, it’s quite open. Q: Do you do research and development yourselves or do you take it from AMD and NVIDIA? A: There’s lots of research online that we tend to look at - SIGGRAPH or GDC presentations. With performance, we have contacts with AMD and NVIDIA. Opaque lighting shader, that’s one shader, very hard to get to run fast and balance across architectures, so we work closely with them to hit the performance goals with those. Q: PBR uses lots of resources - do you communicate with NVIDIA & AMD to further develop PBR tech? Designing the Xi’An - Xi’An are not a predator. They need to have lips for the language. They’re good at tech (anti-grav) and they have a long lifespan. All Xi’An must serve the Emperor, and join houses. Xi’An society is ruled by the emperor, but dominated by family houses. Last week they had the question of “How do Xi’An sleep?” Might not see in-game, but it’s an interesting question. Where they came from, what society is like, do they lie down? Do they stand? Creates a living breathing species. Xi’An eat carrion, like spicy food. They weren’t the top of the food chain for a long time, so they were cautious and scavenger eaters. They created 30,000 years of history for the Xi’An. They have a homeworld - RyiX’yan. They’re not the top of the food chain, and they don’t live there anymore. There’s a concept of verticality with many Xi’An ships. First popped up with the Xi’An Scout ship. Xi’An are ‘patient diplomats who are slow to anger, but who can carry a grudge for a long time due to their centuries-long lifespan. Once they put that info out to art and design teams, they could work in an abstract way and come up with things from there. The Kr’Thak are TBD. They used terms to develop them. Banu are the Traders. Tevarin are the Ronin. Vanduul are the Warriors. Xi’An are the Diplomats. Shows what each represents on the surface. They started with very rough shapes and refined it, detailed as they worked their way in. That was the approach they took. Once you establish the basic tone and character you can forget, because you’re keeping in mind who they are as a culture. Dave could forget which Xi”An house controlled the second dynasty, because as long as he rembered who they were, he could keep developing. Who are the Xi’An? Seems like a silly approach, but it can give a lot of answers. When Chris and Dave were first talking about the framework that would become SC, they had the Vanduul, Xi’An, Banu, and Tevarin. Those are the four main ones, plus Humans and Kr’Thak. The question to tackle was who are each of these civilizations. They started with very rough shapes and refined it, detailed as they worked their way in. That was the approach they took. Once you establish the basic tone and character you can forget, because you’re keeping in mind who they are as a culture. Dave could forget which Xi’An house controlled the second dynasty, because as long as he remembered who they were, he could keep developing. They also look into interactions between them - how they interact together. There’s a set on Spectrum of how to learn Xi’An. There’s a 130 page document with videos. The inspiration is very Asian for the language. E chi kao xyo ma’ma. E (be) kao (be here in) xyo (house). Someone is here in the house. Chi (now), ma’ma (ma means ‘animal’. Ma’a - fauna. Maten - edible meat. Yal’ma - sentient animal. Ma e ma - her/his animal - ma’ma (beast). The beast is in the house. Q: Is this a template to use to create other civilizations? Q: Regarding other languages, will we get tutorials for then? Q: In many games we’ve seen races are very encapsulated to roles. Do you see your races being like this or with more varied roles? A: Don’t want to have monolithic evil empires. Variations throughout Xi’An culture - youth culture likes the impetuousness of humans. The basic idea of each race is just a launching point. Need elements in the culture that challenge the norms. Not interesting if there’s no variation within the race. Every culture and race is fleshed out - not just the archetype. Q: Will we have a translation of Xi’An on the website or a live translator? A: Can’t speak for future tech in the game but if everyone wants it then it’s possible. It’s a full language and there are still some words that need to be added. In theory it could work. You can view the dictionary on the website soon. Q: Would it be possible to have the lines translated as subtitles in game? Q: How would you class, in comparison to other languages like Asian languages, how would you classify the language in terms of difficulty to learn? A: The grammar is not exactly based on Asian languages. The words don’t change shape. The words are very simple. Don’t need to learn complex morphology. Need to learn to hear things differently, but not too difficult to learn. Rules are straightforward. Q: What kind of jobs are there if you have a linguistic degree of some sort? A: Armchair linguist. Started doing constructed languages ~ 6 years ago. If you are interested in tackling working on constructing languages, go explore the world, because there’s a world of people that create languages. Some do it professionally and collaborate with writing teams. But the first thing is to learn about the world that’s out there. From that, you will find different avenues into pursuing it as a partial career. Next group will be the art of stanton. There are a large variety of locations in a system. Within one system, they want a canvas, and they want a variety of contrasts in the canvas. Lately they’ve been building out moons from start to finish. They’re going to build a moon live, and possibly show us a little glimpse of what’s coming next. They want to stretch the areas between the planets out. Hurston is appropriate - super polluted. Main landing zone is a city covered in ash. ArcCorp - totally urbanized; imagine a day / night cycle on a planet of cities. Microtech - terraforming accident. Thick clouds. Lots of possibilities to do extreme weather. They’ve been working on a corner of Stanton. 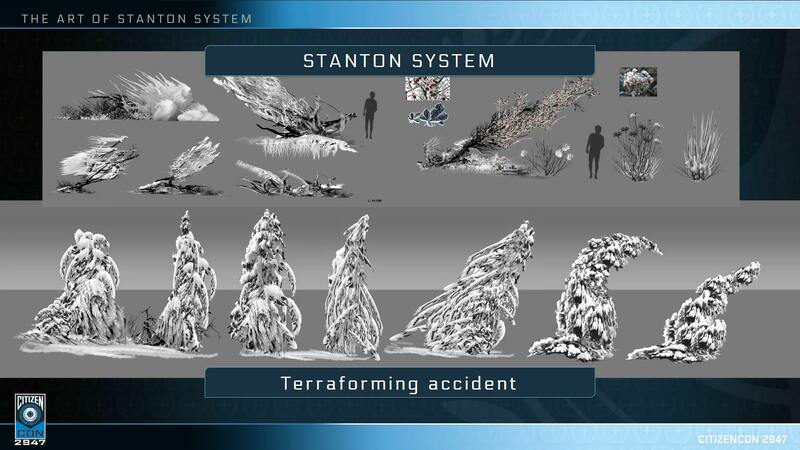 Slowly they’re describing the stanton system. As they move forward, they can describe more and more. They always start with lore, as that’s the best place to start within visual design. If they’re working in one corner, they’ll get to the rest of the system, and they’ll just have skittles - taste the rainbow. Lore helps with the initial starting point. They start by thinking about biomes. They create mood boards; lore and location area easy, then they collect images to find a palette that works. They can start to see the tapestry of the moons. There’re 100 dormant volcanoes on Cellin. Daymar was described as the biggest of the three moons. Quite thick in atmosphere. They developed a physically based tool for atmosphere. Four major levels of detail to look at. How does the planet read from a distance? Are there visible differences between area? What’s the shape of the terrain? Original procedural planet implementation was artistically limiting. However, V2 vastly improved this and allowed for multiple biomes on one planet. Daymar is defined by valleys and canyons. Yela has mountain ranges, but also a giant ice-sheet. They have some examples as how they got to where they are now. Gradually over time their level of detail has improved drastically to something that feels right. They have a large variety of rocks, but they’re getting vegetation and colour in now. Lots of assets are reused with slightly different textures / colours. Work was done to get the terrain and textures in a good state and then it was followed up by scattering assets throughout the environment. Initial scattering looked quite wrong but there has been a big improvement. Close up details came later and look spectacular. Fantastic closeup materials for each area. Closeup material palettes are blended together to give a good breakup to make the surface less repetitive. No ice shader or fluid simulations yet. Always try and come back to how things appear in nature and attempt to emulate that. They have one of the makers of the My Radar app on now. They have the exact atmospheric detail, gravity, size, etc… of each of the moons. No time for Q&A for this presentation. Back in 10 with Pioneer presentation. Panel will talk about aesthetics, technical design, and how it works in-game. Todd Pappy, John Crewe, Paul Jones, & Tony Z. Stake your Claim: Idea is land settlement that happened in the States & CANADA in 1889. Ship is built to go and settle unknown lands. Couple of prereqs. Procedural planets create a huge play area that needs to be filled; letting the citizens fill it. Needed to establish two ends of a spectrum. Cities, like Area 18, and outposts, in the middle will be villages which they’ll introduce later. Outposts are basically campsites. Procedural building tech we’ll see in the future. The ship fits into the game it’s a mid-long term ship for building outposts. It’s for orgs, or a single player that wants to run AI. Normal process of ship design - design brief, tech design 1-page, tech design white box, concept, sign off. They had to extrapolate the mustang up to the Pioneer. They couldn’t just take a mustang and go Schwoop. Talked with Nathan Dearsley and Paul; they didn’t do a whitebox for the ship. They did mood boards and such for what they wanted CNOU ships to look like. It was clear from that what they wanted the ship to look like. Ship Matrix went live last night - Length - 200 m. Cargo capacity - 600. Mass - 35.6m kg. Went from 4 manned turrets to 2 manned, 2 unmanned turrets. This came about because sometimes it’s just hard to get a man to a manned turret. Unmanned is easier. Process has been very challenging, but it came about as a ‘how do you concept a crazy flying transforming multiplayer factory? Monolithic Manufacturing = Asymmetrical Design - Function over Form. The Mustang is one of the really early ships, and not much had been done in terms of the style guide. The Pioneer is more of an industrial CNOU, like the Reclaimer is more of an industrial Aegis. They give Chris multiple options; he wants to see many options before he’ll approve one. Basic blockout animations have been done to see intended function. Sides of the ship are where the manufacturing takes place. The middle is where the outposts are assembled. The “arm” is an exterior walkway. The bridge is asymmetrical as well, holds the habitation area. There’s cargo space and a landing pad, and there are two staging areas. Where robots are, where things get built. Before you can begin construction of your outpost, you need to select and purchase a plot of land. What you have to pay for that depends on several criteria. Knowledge has value. Resources present and quantity are tracked for each plot of land, as is current market value, level of certainty, when info was last verified, and location. 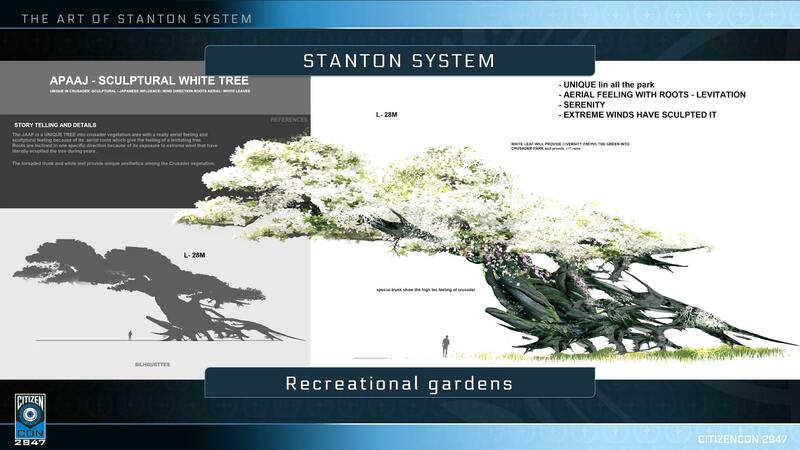 Information within star citizen is very often an analog concept. You don't necessarily know something, you know things to varying degrees. The easiest way is to consider a car you’re gonna purchase. If you haven’t seen the car, you’re gonna be conservative about what it’s worth. If you're even able to see it from the exterior, that’ll increase your perception of its value. If you can turn it on, take a drive, get a mechanic to look on, that’ll bring it farther up the scale. With the value of land, outposts will be set up in optimal locations, they’ll be verifying all of these sorts of things. Knowing there’s a lot of gold in an area, but the info is 2 weeks old, that’s not as valuable. Players will have to refresh knowledge of an area to update its land value. Support ships - Origin 315p, Terrapin, Carrack. To get the knowledge, you have to go explore. This is where exploration ships come in. The Pioneer won’t be the best ship for scouting locations. The design for finding all the information out; you wouldn’t take an oil rig and randomly search, you’d send scouts out to find the best location. The common theme they’re trying to execute on is that all the high level ideas have a variety of ways that the community can attack them. Actually claiming land - Claims are not tied to the Pioneer. A single person / org can buy them. There’s UEE space and non-UEE space If you settle in UEE space, you need a claim. If you’re in non-UEE space, you don’t need a claim. If you do plant in UEE space, the idea is you get protection from the UEE. It’s transferable between players. UEE will take a cut of that in a title transfer cost. General licenses, later they’ll portion out specific licenses. There’ll be a beacon to claim land. You set down the beacon, and someone takes the info to the closest UEE colony office and that’s when it locks in, and that land is yours. One of Tony Z’s favourite concepts it that of speculation. You’ve purchased land, you go out, and you either bought it with knowledge it contains some minerals. Do you extract the value now - if whatever it contains isn’t worth much, you may wait to harvest whatever it holds. Until the value is increased. There’s many ripple effects; when you own land, that doesn’t prevent someone else from going there and extracting the resources. If you do it within UEE space, it’s a criminal offence, and the security system will deal with it as appropriate, but police don’t patrol everything all the time. Holding on to that property waiting for a better payday has real implications. In addition to relying upon the system security, do you want to put your own sensors there? If someone mines on your land, you could go there and push them off. Could also hire mercenaries to patrol your land. Just touching the surface here too. Don’t necessarily have to do the full end to end cycle. Could buy / discover land and flip it once you verify it, as opposed to you exploiting it yourself. With the Pioneer; preparations. First thing you have to do is collect materials and addons. Know what you’re building so you don’t do five trips to build something. If you know what you’re building and the resources required, your’e good, or you can have the resources brought to you. 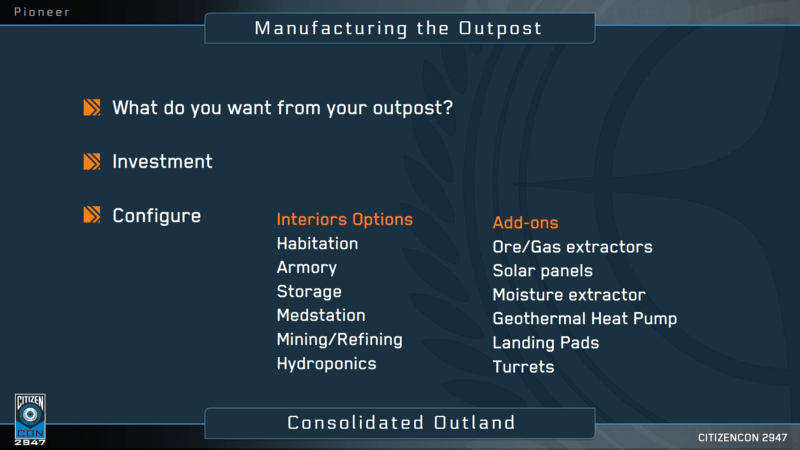 What do you want from your outpost? Moisture farmer? Revenue generation? Depending on the size of your outpost, that’ll increase the build time. If you put something in Earth v Mars v Venus, all different climates. Wear and tear will affect the outposts. Q: Can you land a freelancer or something to increase the amount of materials you need on the feet? A: Landing pad fits 40x40 meters. Lots of room. You could push it, but it’s got a lot of room already. Q: Will the outposts be self salvage-able? Q: Able to spawn at a medstation? A: That’s the goal, yes. Q: What ship does the pioneer fit in? A: Doesn’t fit in any. Q: What ship fits in it? A: None. It’s just a landing pad, not a hangar. 30 minute break, then Chris! Chris Roberts takes the stage. Anyone at CitCon gets a free weapon designed at the con when 3.0 goes live. Right now they’re working on getting 3.0 out. It’s currently in Evocati. Delta Patching is great for the devs, also helps for the Evocati, not having to download 20 gigs each update. Beyond 3.0 - what’s next. Shift to a date-drive model vs. content driven model. Quarterly releases. There’ll be a roadmap of features they’re working on. Things that make the date make the release, otherwise they shift to the release after it. More to iterate on and play. For 3.0 it’s feature locked, they have to deliver everything at the time. After 3.0 though it’ll deliver more regular stuff. Working on production report formatting. Will update it next week for close-down of 3.0. 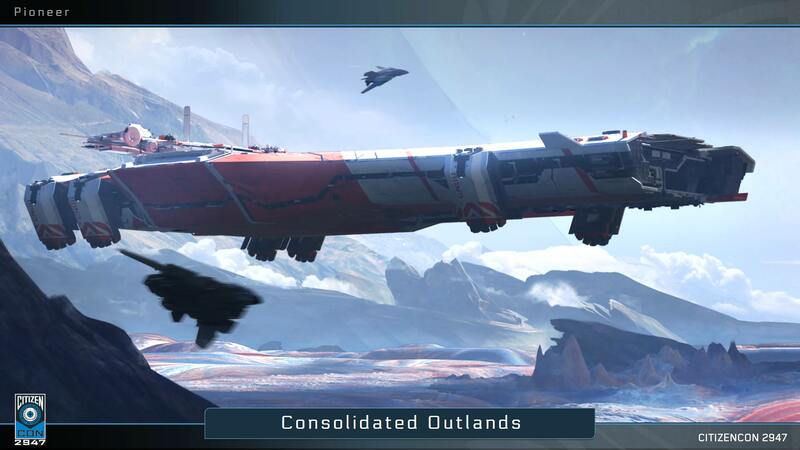 Beyond 3.0 they’ll update a full roadmap for order and content, as they go live with 3.0 they’ll release that, and then there’ll also be a roadmap for SQ42 during the holiday livestream. 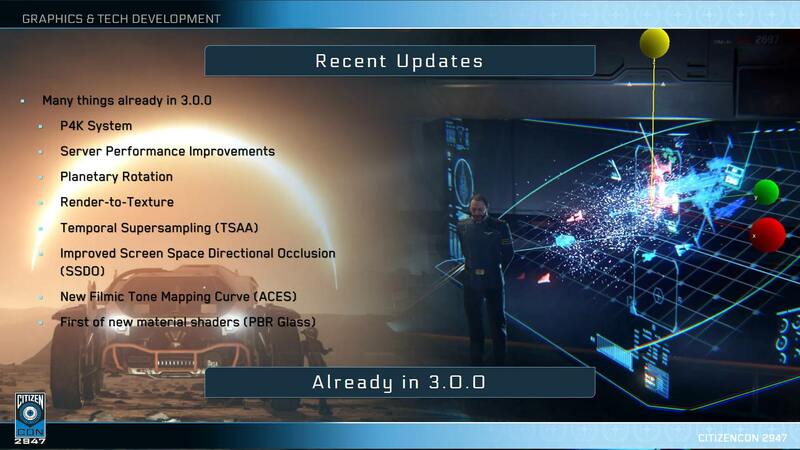 What they’re working on beyond 3.0. Sabre Raven - being shown off in Astro Armada right now. Lorville is a waypoint in the background; it’s a city on Hurston. New Arc Corp being shown off, lots of NPC’s walking around. Much easier on the eyes. No skybox in ArcCorp right now. Everything’s physical. It’s all there. Much larger than ArcCorp was in the social module. Going out through customs. They’re jumping into a Terrapin. Vista is very Blade Runner. Nevermind, jumping in an Aurora. There is a Terrapin on the pad though. They’re flying over the procedural ArcCorp planet. They’re gonna just fly around the ground. ArcCorp is procedural. 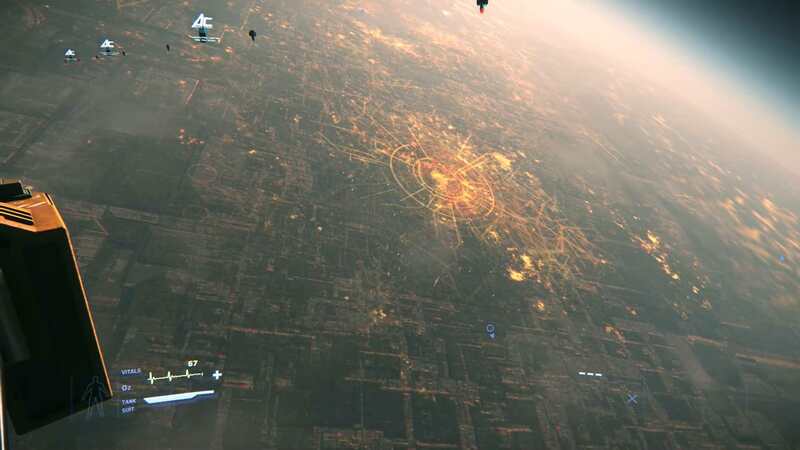 ArcCorp is an earth-sized planet completely covered with Earth-size structures. You can fly all over ArcCorp. Flying over the suburbs, city as far as the eye can see in all directions. There’ll be multiple landing zones around ArcCorp Area 17, 18, there have to be more than just one or two landing zones. They’re going to head to another planet now. Heading out of atmo, you can see towers off in the distance, the smoke pillaring, obscuring the sky above. As the ship rises, the sky clears, a haze visible below. A haze and a labyrinth of city, a mass of man-made attributions to the power and skill of humanity. They’re heading to a orbital system now. No loading screens. They flew up from Area 18, and they’re heading to the orbital space station. From the station, the city below looks like a million fires, the glow of the ashes reflecting on the clouds above, and back down, and back up, a view of a cracked, torn world, rent asunder by Humanity’s best, and most human, efforts. The smoke in the atmosphere mutes the light from the cities below. Gravity is simulated all the way through, though it’s much weaker in space. The station has a full set of interiors. They’re using an Aurora CL. He didn’t turn it off, so it’s still running. Smooth transition from procedural planet to procedural station, no loading at all. The station is detailed to a level we’ve never seen before. The atmosphere of ArcCorp obscures everything, even the beauty of the planet before. They head now to Hurston, a hopefully cleaner planet, one where we can appreciate more the beauty, without the lens of corruption. They’re travelling 23,000,000 km. Takes ~8 minutes. While they’re jumping, they’ll look back at some of the tech we saw at ArcCorp. Sean Tracy’s on stage now. Tech director of content. They give it a seed and the tool builds an interior area for them. It generates a massive amount of content in mere minutes. Shops are infilled; walkways, rooms, everything. They can put stairs nodes in to get multiple levels too. Change the seed, and they can generate different sets of interiors. The cities and the interiors are procedurally integrated. They’re heading towards Hurston now. You can see the atmosphere hugging the planet; holding on as if it would die if it let go. It colours the edges of the planets, graying them, blurring into the dark background. They’re heading to Lorville now. Everything they’re showing now is WIP. They’re doing a short-distance Quantum travel. There’re two types of Quantum. Between major celestial bodies, and and short distance that goes only within a body. Gets you to a low orbit gateway. The planet below is a map of mountains, valleys, oceans and clouds; a hazy vista of green and grey, melting into brown. The ship heats up as it enters atmo, the particles flaring off the front end. The tiling is excellent everywhere but the water, and even there, it looks great under the evening(or morning) sun. The jetties of the Lorville shores stretch out into the water around it, fingers reaching towards the deep. Oceans have been ported to GPU, and if you get low-enough, there’s full wave simulation on waters. The wake from the ship will eventually create waves; not in yet, but it’ll happen at some point. On every horizon, an image pulled straight from a Windows background wallpaper. The sun splits the clouds, parts the mountains, assails the eyes. Beauty in its most visceral form. Broken equipment dots the torn landscape, there’ll be much more mining and infrastructure in the future; it’s been strip mined, torn asunder, and left. They’re fleshing out secondary locations now. They’ll be adding macro vehicles that will excavate dirt, tearing the soil asunder, reaching for its hidden treasures. They’re reaching Lorville now; the main building at Hurston towers over the rest of the polluted buildings and landscapes that surround it. It’s built out with a different building set, but it uses all the same city building tech. As you fly past each individual monolith, you realize how small you are; ant-like against a horizon of giants, a strand of string drifting through a city of mountains. There’s a monorail in the distance, a useless waste of money in a city of demons. Flora dots what soil is left around the broken city; sad trees gasping for air in a landscape of smog and decay. The trees are fat and stubby, the buildings tall and smooth, a sense of anger and greed fills the air. We hop on a bike, the emotionless voice welcomes us, tells us that it is powered, devoid of feeling, devoid of life, just like the landscape that surrounds us. The phallic exaggerations of human inadequacy rise into the sky, spewing fire and black smoke. Longer term, CIG are working on background crowd simulations, crowd simulations, etc… then there’ll be foreground mission givers and such. All areas will be populated and feel full of life. Goal is still 90% NPCs to 10% players. ArcCorp, Lorville, they have to feel like they have millions of players. They’re working on fauna, and now some are being shown. The OniCrabs are scavengers on Hurston; one species among many. 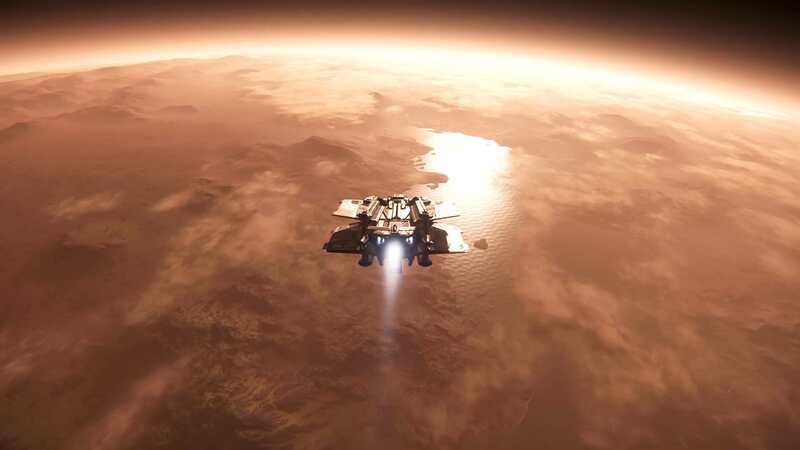 That’s Lorville, that’s Hurston, that’s ArcCorp, that’s where they’re going. Chris calls everyone up on stage to get a round of applause. There is a gigantic Happy Birthday Star Citizen cake.